MILAVIA > Forum > Historic Aviation > Aviation History > Aviation Fuel from the Wright Brothers until now. Aviation Fuel from the Wright Brothers until now. For the first few decades of flight, aircraft engines simply used the same kind of gasoline that powered automobiles. But simple gasoline was not necessarily the best fuel for the large, powerful engines used by piston-driven airplanes that were developed in the 1930s and 1940s. Before World War II, Major Jimmie Doolittle realized that if the United States got involved in the war in Europe, it would require large amounts of aviation fuel with high octane. In the 1930s, he headed the aviation fuels section of the Shell Oil Company. Fuel is rated according to its level of octane. High amounts of octane allow a powerful piston engine to burn its fuel efficiently, a quality called "anti-knock" because the engine does not misfire, or "knock." At that time, high-octane aviation gas was only a small percentage of the overall petroleum refined in the United States. Most gas had no more than an 87 octane rating. Doolittle pushed hard for the development of 100-octane fuel (commonly called Aviation Gasoline or AvGas) and convinced Shell to begin manufacturing it, to stockpile the chemicals necessary to make more, and to modify its refineries to make mass production of high-octane fuel possible. As a result, when the United States entered the war in late 1941, it had plenty of high-quality fuel for its engines, and its aircraft engines performed better than similarly sized engines in the German Luftwaffe's airplanes. Engine designers were also encouraged by the existence of high-performance fuels to develop even higher-performance engines for aircraft. A major problem with gasoline is that it has what is known as a low "flashpoint." This is the temperature at which it produces fumes that can be ignited by an open flame. Gasoline has a flashpoint of around 30 degrees Fahrenheit (-1 degree Celsius). This makes fires much more likely in the event of an accident. So engine designers sought to develop engines that used fuels with higher flashpoints. The invention of jet engines created another challenge for engine designers. They did not require a fuel that vaporized (turned to a gaseous state) as easily as AvGas, but they did have other requirements. Instead of using gasoline, they chose kerosene or a kerosene-gasoline mix. The first jet fuel was known as JP-1 (for "Jet Propellant"), but the U.S. military soon sought fuels with better qualities. They wanted fuels that did not produce visible smoke and which were also less likely to produce contrails (the visible trail of condensed water vapor or ice crystals caused when water condenses in aircraft exhaust at certain altitudes). But a major requirement was for fuels that did not ignite at low temperatures in order to reduce the chance of fire. Certain types of aircraft operations also demanded that specific types of fuel be available. For instance, the U.S. Navy had to carry large amounts of fuel for the planes and helicopters on its aircraft carriers. When most of the aircraft were piston-driven, they carried AvGas, which had a low flashpoint and was therefore dangerous to have on board because it could easily catch fire. The advent of jets led the Navy to seek jet propellant that had a higher flashpoint than JP-1. Whereas most Air Force aircraft soon used a kerosene-gasoline mix called JP-4, which already had a higher flashpoint than standard AvGas, the Navy developed a fuel known as JP-5 with an even higher flashpoint than JP-4. It also sought to retire aircraft that used AvGas. Fortunately, the introduction of turbine engines on helicopters and for propeller-driven airplanes also reduced the Navy's need for AvGas. Navy leaders are extremely safety-conscious about fuels. When a Navy jet is refueled in flight by an Air Force tanker with Air Force fuel, safety rules prohibit the plane from being stored below deck on the ship when it lands. Aircraft operators are constantly refining their fuels to deal with specific performance concerns. The U.S. Air Force during the 1990s switched from JP-4 to JP-8 because it had a higher flashpoint and was less carcinogenic, among other things. By the mid 1990s, the Air Force further modified JP-8 to include a chemical that reduced the buildup of contaminants in the engines that affected performance. JP-8 has a strong odor and is oily to the touch, which makes it more unpleasant to handle and less safe in some ways (military personnel who work with it complain that it is difficult to wash off and causes headaches and other physical problems). About 60 billion gallons (227 billion liters) were used worldwide by the late 1990s, with the U.S. Air Force, Army, and NATO using about 4.5 billion gallons (17 billion liters). The development of the A-12 OXCART spyplane in the late 1950s created another problem for aircraft and engine designers. The high speeds reached by the A-12 would cause the skin of the aircraft to get hot. Temperatures on the OXCART ranged from 462 to 1,050 degrees Fahrenheit (239 to 566 degrees C). The wings, where the fuel was stored, had external temperatures of more than 500 degrees Fahrenheit (260 degrees C). Even with the lower flashpoint, fuel stored in the wings could explode. As a result, the engine designers at Pratt & Whitney sought a fuel with an extremely high flashpoint. Working with the Ashland Shell and Monsanto companies, the engine designers added fluorocarbons to increase lubricity (or slipperiness), and other chemicals to raise the flashpoint. The resulting fuel was originally known as PF-1 but later renamed JP-7. 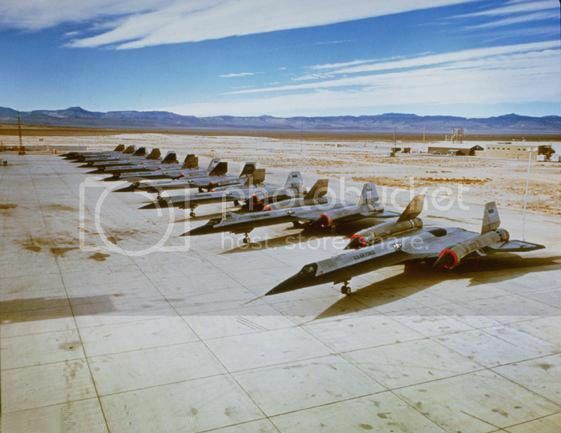 It was used only by the A-12 OXCART (and its sister YF-12 interceptor) and later the SR-71 Blackbird. JP-7 has such a high flashpoint that a burning match dropped into a bucket of it will not cause it to ignite. Engine designers and fuel chemists created JP-7 with a high flashpoint that would not explode in the aircraft's tanks, but this also made the fuel hard to ignite within the engines themselves. Because JP-7 is so hard to ignite, particularly at the low pressures encountered at high altitudes, these planes used a special chemical called tri-ethyl borane (TEB), which burns at a high temperature when it is oxidized (combined with air). Another problem that the A-12 encountered was that the engine exhaust (particularly shock waves created in the exhaust when the engines were at full afterburner) was easily seen by radar. The engine designers added an expensive chemical known as A-50, which contained cesium, to the fuel for operational flights that reduced its ability to be detected by radar. Re: Aviation Fuel from the Wright Brothers until now. I'd heard of an additive for the -71, and then, somewhere, heard that the B-2 also uses an additive to reduce or eliminate contrails. The B-2 also has to seek out, and stay in, the band of the atmosphere where contrails are less likely to form. The B-2 seems so vulnerable if found.